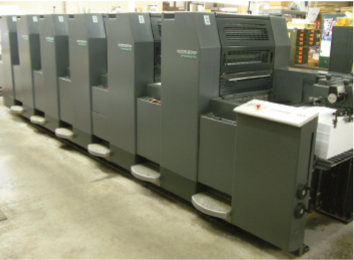 Our pressroom is equipped to handle an assortment of print jobs from 1 color letterhead to 6-color brochures. Heidelberg press equipment, which has been the industry leader for decades, operated by our experienced press crew, means quality is never a problem. We have incorporated a system for matching 4-color process and PMS colors with our digital proofing equipment, so every job is up to specification. This allows us to match the specifics of each order to include all the necessary color matches and paper specs. We stock gloss and silk paper in cover and text weight as well as many standard stationery papers.